Share the post "Cephalanthus Occidentalis Or Buttonbush: Growing Tips"
Cephalanthus occidentalis, commonly known as Buttonbush or Honeyball is a species of flowering plant in the coffee family, Rubiaceae. Buttonbush is a common shrub of many wetland habitats in its range, including swamps, floodplains, mangrove, pocosin, riparian zones, and moist forest understory. This American native shrub develops striking pincushion-like, honey-scented white flower balls. Each tiny individual flower has a long floral tube filled with nectar that attracts butterflies and bees. Flowers are followed by attractive fruits, which are spherical clusters of achenes (nutlets). Buttonbush is a handsome ornamental shrub suited to wet soils and is also a honey plant. The town of Buttonwillow, California was named for the buttonbush (Cephalanthus occidentalis). Plant type: Shrubs. Perennial. Deciduous. Soil: Clay, Loam, Sand. Mildly acidic, Neutral. Poorly Drained. Moisture: Consistently moist soil. Don’t let dry out between waterings. • From seed – sow fresh, untreated seeds direct outdoors in fall or winter sow in vented containers, cold frame or unheated greenhouse , sow indoors before last frost or direct sow after last frost. • From softwood cuttings, semi-hardwood cuttings. Sticks can be just poked into the ground in moist water edges and they will sprout. 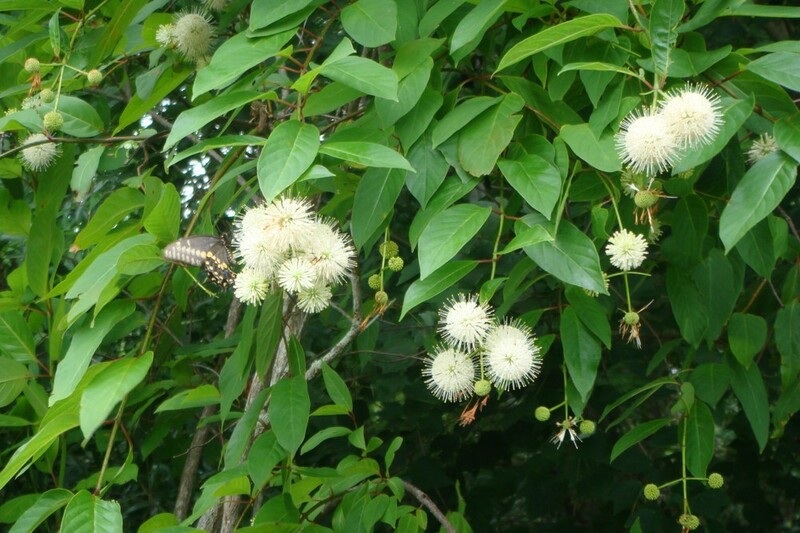 Medicinal uses: Cephalanthus occidentalis (Honeyball) has a number of historical medicinal uses, but it is also toxic due to the presence of cephalathin. Native North American Indian tribes who used it to treat a range of ailments. The inner bark has been chewed in the treatment of toothaches. A bark tea is astringent, emetic, febrifuge and tonic. A strong decoction has been used to treat diarrhoea and dysentery, stomach complaints, haemorrhages. It has been used as a wash for eye inflammations. A decoction of either the roots or the fruits have been used as a laxative to treat constipation. The leaves are astringent, diaphoretic, diuretic and tonic. A tea has been used to check menstrual flow and to treat fevers, kidney stones, pleurisy. The plant has a folk reputation for relieving malaria. Fertilizer: Tell us if you know. Toxicity: The leaves contain glucosides and can be toxic in large doses if ingested, unpalatable to livestock. • If collecting seeds, allow pods to dry on plant. • Good plant for draining wet or moist soils. • If you like butterflies and bees this plant is a must have. • A good companion to the buttonbush is turks cap hibiscus. • This is an ideal native shrub to plant as a bank stabilizer around water bodies or in moist woodland glens. Can be planted on slopes to help control erosion. • Buttonbush is a salt tolerant species, so it is also ideal for moist, oceanside plantings. • An easily grown plant, it prefers an open position. Do you grow Cephalanthus Occidentalis (Buttonbush) in your garden? What is your experience with this plant? Please share with other fellow gardeners in the comments below! Do you sell Cephalanthus Occidentalis (Buttonbush) seeds or have plants for sale? You can place your advertisement here. Contact us now!